Ending a marriage is a huge decision. It’s a choice that impacts every facet of your life. Divorce is the most obvious option when a relationship is over, but in some cases, it’s not the best one. There are situations where staying married, but separating, may work. It begs the question whether divorce or separation is right for you? While it may seem like a strange choice, in some cases, legal separation has definite benefits. Every situation is different, so neither divorce or separation is a perfect fit for every case. But circumstances exist where opting to remain married makes the most sense. On the surface, the most readily apparent difference between divorce and separation is that in one, the couple remains married, while in the other, they do not. It’s pretty simple and straightforward in that regard. Divorce dissolves a marriage. The union legally comes to an end. Former spouses are now free to pursue their lives without the complications of being married. They can date, remarry, and generally live their life without marital entanglements. Though a marriage may be, for all practical purposes, over, with legal separation, it remains technically intact. It’s possible for spouses to lead entirely separate lives but remain legally bound. In this scenario, people have to mark married on forms and can’t marry someone else. It’s also possible for separated couples to inherit property from one another and even receive benefits. These are big reasons why some people choose this route. While there are distinct differences between divorce and separation, the two also share similarities. One is obviously permanent and final, while the other is less so. But for all intents and purposes, the end product is the same. In many cases, a legal separation essentially functions as an effective divorce. A court order lays out a specific split between two spouses. The participants tackle the task of dividing shared assets and debts. When there are children, they must create a parenting plan, deal with custody, visitation, and even child support or spousal maintenance. Though less permanent and binding, the mechanical process of separation often times mimics that of divorce. As that stands, the question still remains, which is the right choice, divorce or separation? When Is Separation the Right Choice? People choose divorce or separation for many reasons. The motivations are as disparate and unique as the factors the lead to the end of a marriage. Some people choose separation as a step towards an eventual divorce, while for others it’s a more permanent state. Some couples opt for legal separation because they hope for reconciliation. Living apart may provide space to work on personal or relationship issues. Some stay married for the sake of the kids. Others are unwilling to divorce for religious, moral, or ethical reasons. It’s even possible two people love and care for one another, yet they simply can’t live together. Financial reasons are a big reason why people choose to remain married but legally separate. In some instances, filing taxes together save couple’s money. There are legal requirements to continue to file jointly in cases of legal separation, so it’s best to consult an expert before trying. After ten years of marriage, a spouse is entitled to a greater share of Social Security benefits. For couples on the cusp of a decade, this provides motivation to put off divorce. Military pensions and other retirement benefits often have similar regulations. These are powerful reasons to stay married. For families with children, separation often proves easier and less traumatic. Depending on age, it may be easier to explain that mommy or daddy lives somewhere else rather than explaining divorce. Negotiating a legal separation is also often less stressful for the adults involved than navigating divorce. And in some cases, legal separation offers the benefits of both divorce and marriage. Most employer-supported insurance plans don’t cover exes. Over the years, divorce has left many without adequate coverage. As with taxes, many companies view legal separation in the same light as divorce, so it’s important to closely examine policies. Still, there are times when coverage continues. Especially in cases where one spouse has a chronic condition, this is often huge. Another factor to consider when choosing divorce or separation. If the case requires attorneys, the cost of legal separation and divorce are virtually identical. For cases without lawyers, the cost may be much less. Down the road, however, if you convert the separation to a divorce, you wind up paying again. These are all financial questions to consider when choosing divorce or separation. 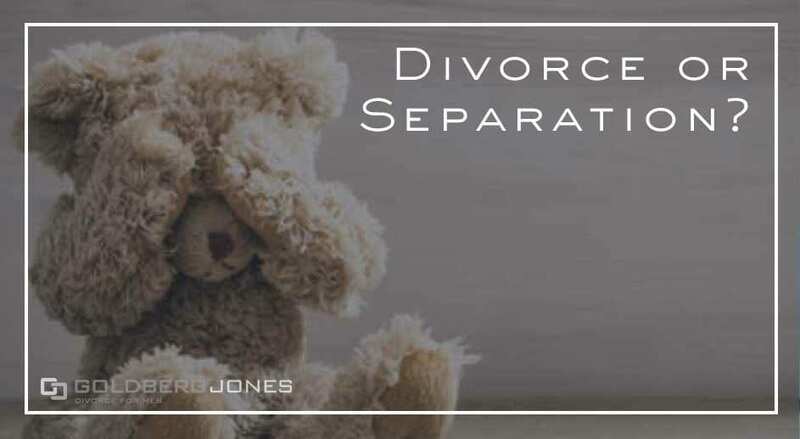 While there are potential benefits to choosing separation over divorce in certain situations, there are also drawbacks. As the name implies, legal separation involves more than one spouse simply moving out. It requires a court order. Just packing up and leaving opens you up to a number of consequences. If you and your spouse own a home together, you may lose any future claim to the property. When you leave kids at home, moving out often impacts chances to become the custodial parent. Moving out doesn’t automatically alter any pre-existing financial obligations. If your spouse runs up debts on joint credit cards or misses payments on a car loan that’s in both your names, you remain liable. Your credit can take a hit and creditors may even come after you for payment. Whether to choose divorce or separation is complicated. There’s no one-size-fits-all answer. Like most cases, it boils down to the specific set of circumstances. In some situations, divorce winds up the optimal choice. For others, legal separation fits the bill. However it plays out, this is a significant decision, one with a lasting impact. Make sure to take the time and consider all of the variables before deciding on divorce or separation.